Welcome to… a different world. The second Tuesday in September started innocuous enough. I was in the British countryside, west of London, along with about 20 colleagues, attending a course on working in hostile environments and battlefield first aid. Too many newspeople had perished while covering wars past, and the company I worked for thought it a wise investment to train its journalists in basic survival so that in the future more would come home from those environments unscathed. Because the next war was bound to break out, sometime, somewhere. 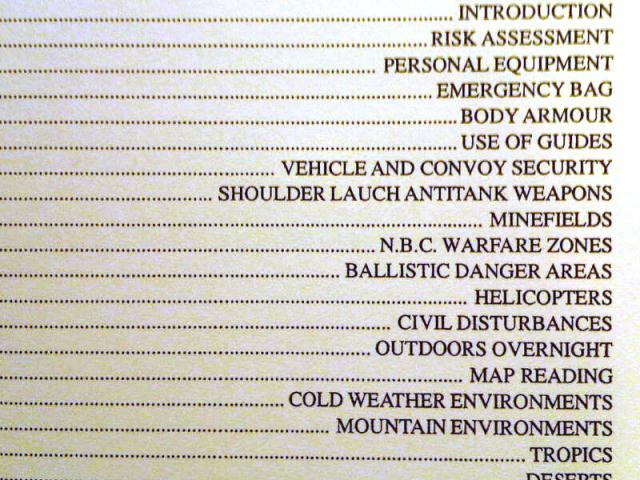 An excerpt from the list of topics to be covered. We learned things like: What kind of damage automatic weapons can do to cars, oil drums and humans; How to spot a sniper, and a tripwire; How to make a water filter using only materials found in nature; What an armed ambush feels like, and how to survive a kidnapping; Why a camera lens can sometimes look like a shoulder-held rocket-propelled-grenade at distance. The course was a week long and I had decided to tack on a vacation to New York City and points north immediately thereafter. So I booked my flight from Heathrow to JFK on United Airlines for the following Saturday. On that week’s Tuesday afternoon we were out in the woods, standing in mud up to our ankles. The assigned task was to practice negotiation skills. Our teachers had dressed up as hostile natives hell-bent on hindering our work at least, or murdering us for our expensive equipment. The overcast sky broke to a fine English drizzle and during a pause in the action a few of us took shelter in one of the vehicles. That was when the first SMS came from New York. It was so absurd that we thought it was some kind of joke. Four filthy, cynical journalists sitting in a Land Rover in the middle of a field in the middle of nowhere, 3,000 miles from New York City, could not believe the audacity of flying a plane into the World Trade Center. While calmly picking clumps of mud out of the treads of my hiking boots with a twig, I scoffed that no aviation routes even go anywhere near Manhattan… so that must have been some dumb pilot. Or just a tragic accident. We turned on the car’s radio to see if the BBC had the story, and heard that a second airliner had just slammed into the second building. Ah. No accident. No dumb pilot. And suddenly our hostile environment training did not seem so theoretical anymore. Four days later, I sat in one of the first aircraft permitted to re-enter U.S. airspace from abroad. Upon landing at JFK, a flight attendant announced our arrival over the intercom. Ten years later, I still get a lump in throat and my eyes tear up when I think of it. The entire cabin erupted in cheers and tears. We were on home soil, and we were safe. As the plane taxied off the runway to its parking position, a white plume of smoke continued to rise from Ground Zero into the cobalt blue sky. Lower Manhattan was still burning. It was September 15th, 2001 – and the world as we knew it was history. 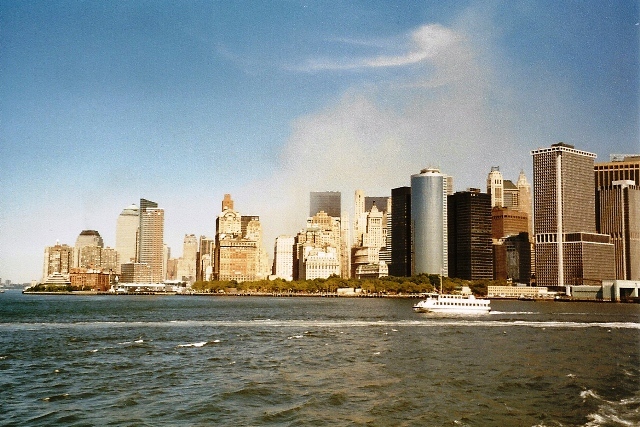 A cloud of smoke where the towers used to be. A piece of a steel skeleton. 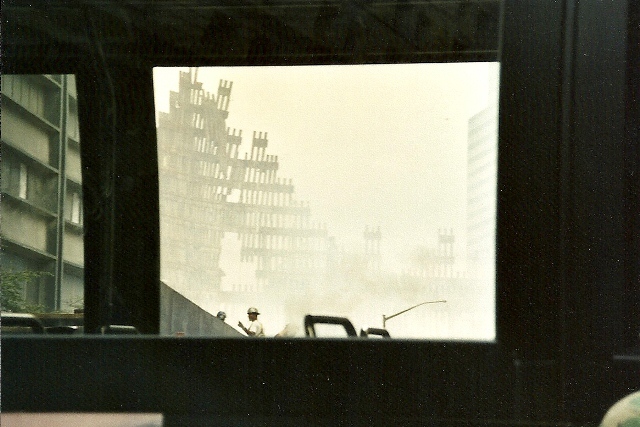 The destruction through the window of a city bus. Guard duty at Ground Zero. 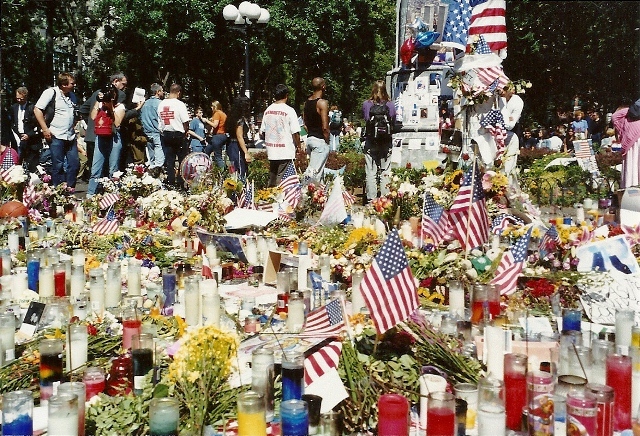 The impromptu memorial at Union Square. NOTE: All photos are my own, taken on September 16th and 17th, 2001. Yeah… it was nuts. Less than six weeks later I was in a fricking war. 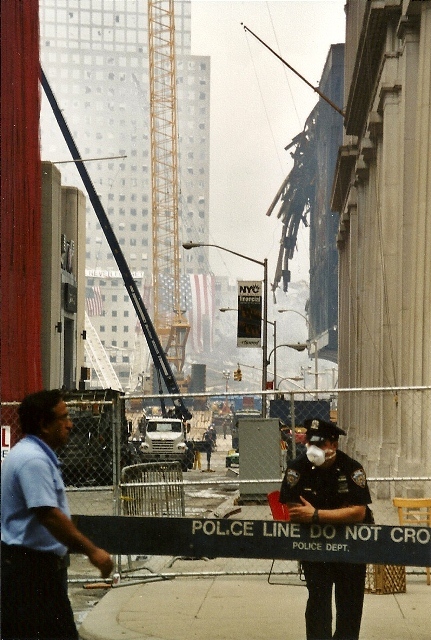 If you weren’t here in the States on 9/11, you missed the surreal spectacle of our government, standing on the steps, singing the same song and not acting like a bunch of rejects from a gangster movie. Too bad that it took something so unimaginably heinous to create cooperation. 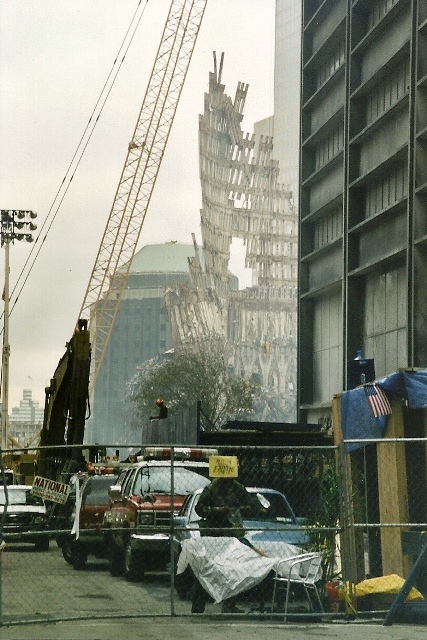 I still miss those towers, and wish we had built them back exactly they way they were, but one floor taller. And thank YOU for your support and for commenting. Somehow, though, I get the feeling that that cooperation was not sustainable, and we have kind of fallen into a thousand pieces since then. At least on the 364 days of the year that are not September 11th. But again, that is the view from far away… perhaps I am mistaken.